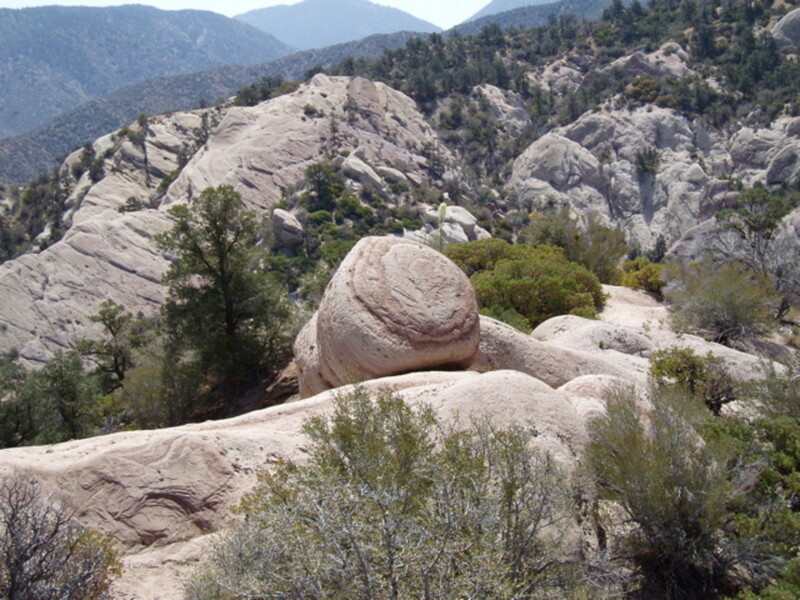 The Devil's Punchbowl is one of my favorite hiking areas. 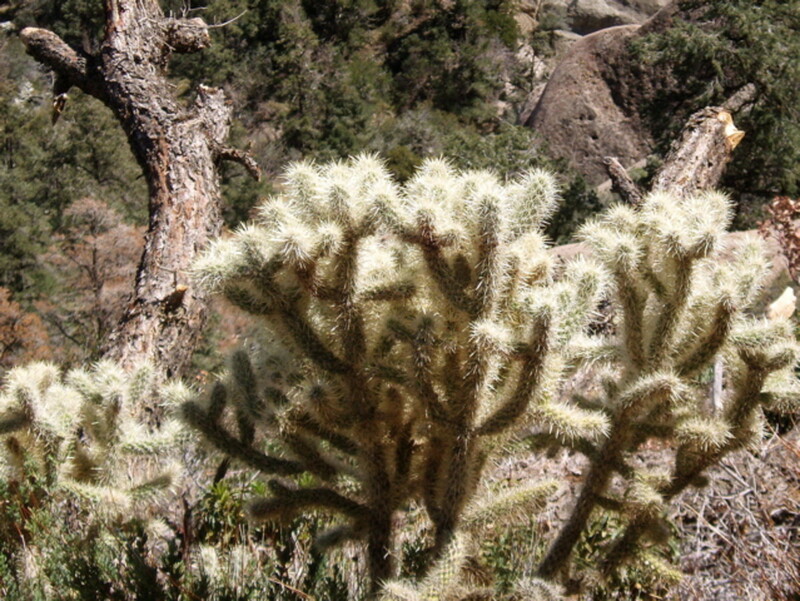 I've hiked there several times a year since 1999 and have taken lots of photographs. The geology of the area makes it extra interesting. 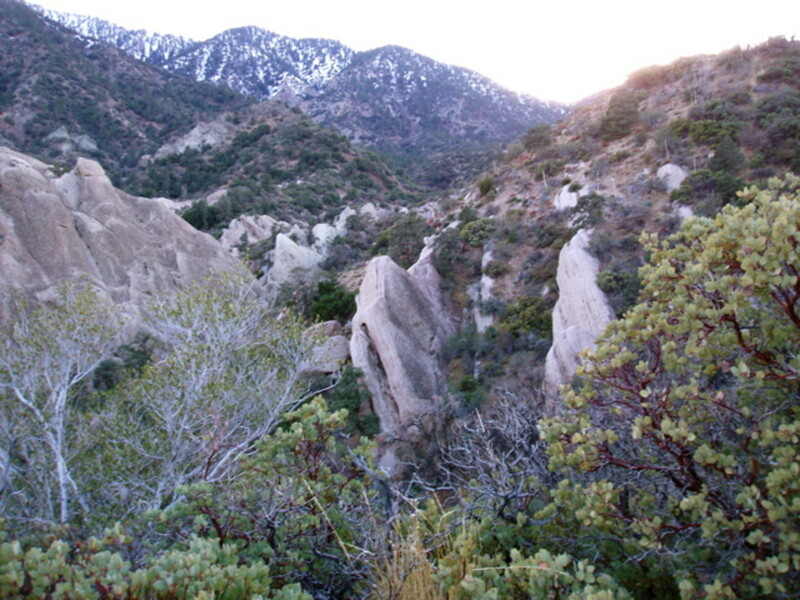 Did you know that the San Gabriel Mountains, where the Punchbowl is located, are actually the edges of two tectonic plates pushing up against each other? Did you also know that these mountains, from base to top, are some of the highest in the world? 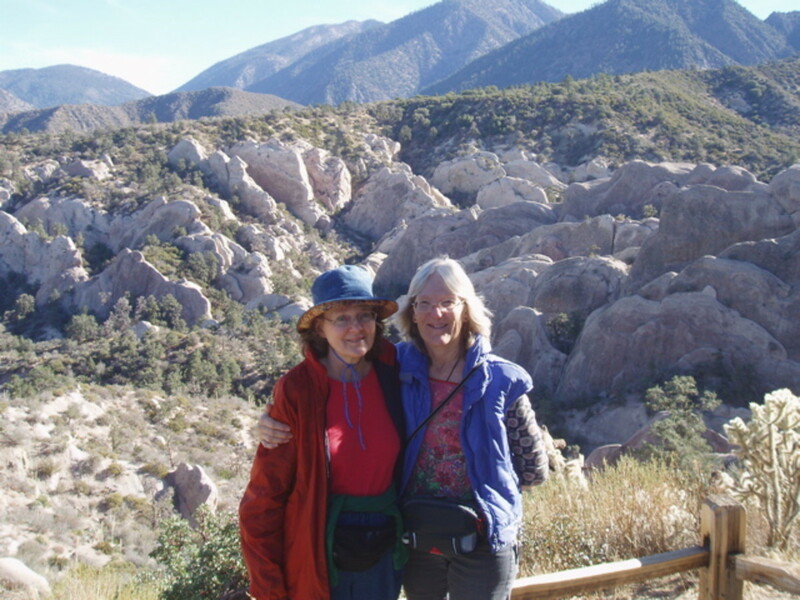 It's a great idea to research before going, or to take one of the geology hikes offered by Punchbowl guides. 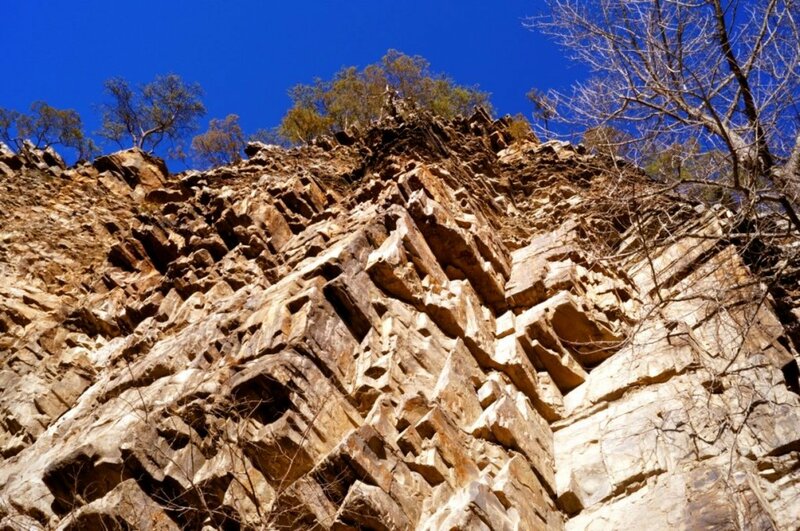 Geologically, the area is called a "syncline"––a fold in the earth. The fold resulted from the edge of two of the earth's tectonic plates pushing against each other as they slipped by over the millennia––the North American Plate heading slowly southwest, the Pacific Plate heading slowly northeast. 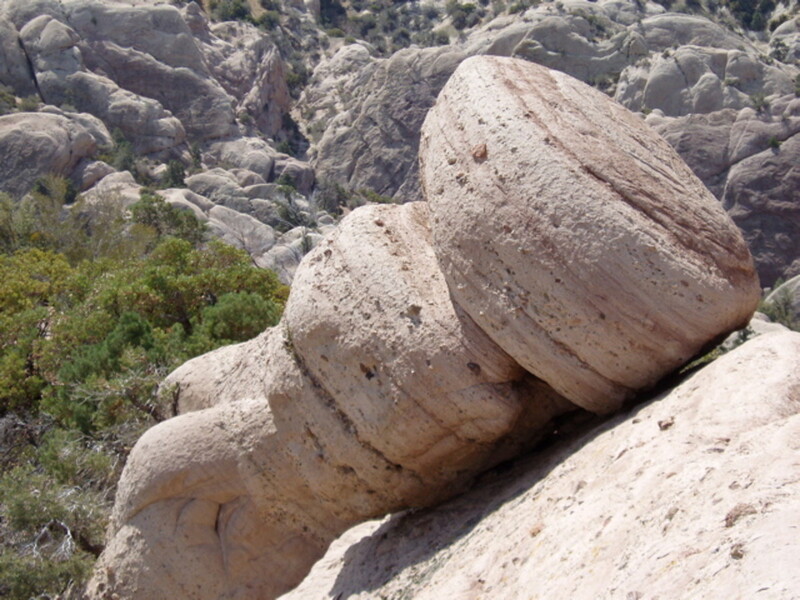 The movements of the tectonic plates shoved up what was once horizontal layers of sandstone and sedimentary deposits until they were almost vertical. 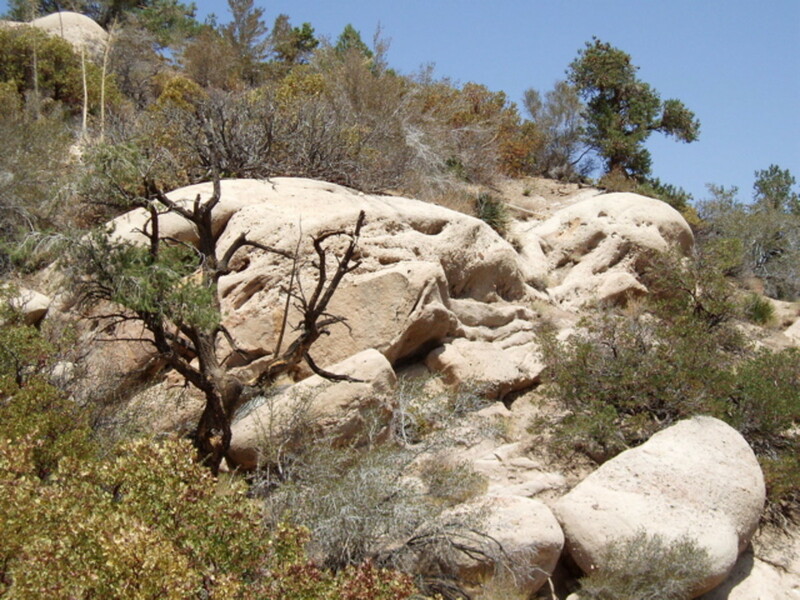 These are the rocks you see pictured above and in the photo collection below. 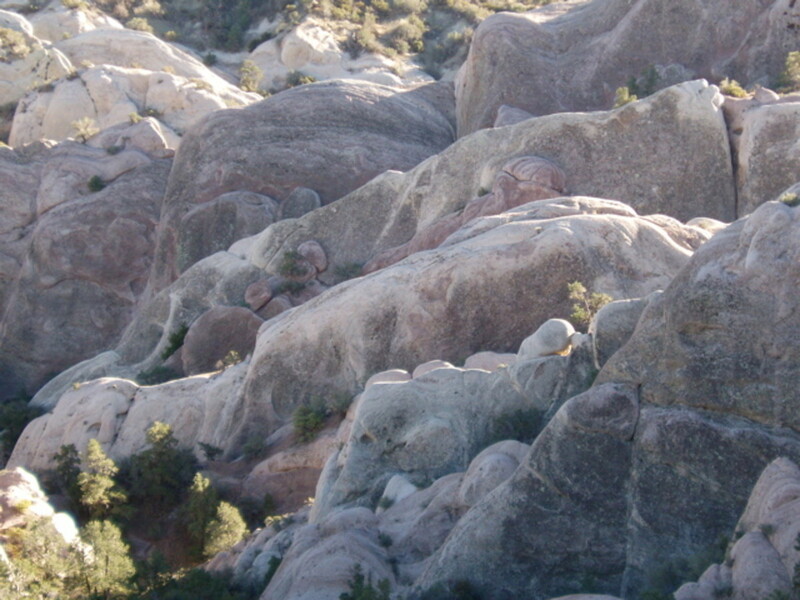 When you're hiking there, it's amazing to see the colors in the rocks and imagine how those layers used to be flat. The earth has to be really powerful to push against itself like that. 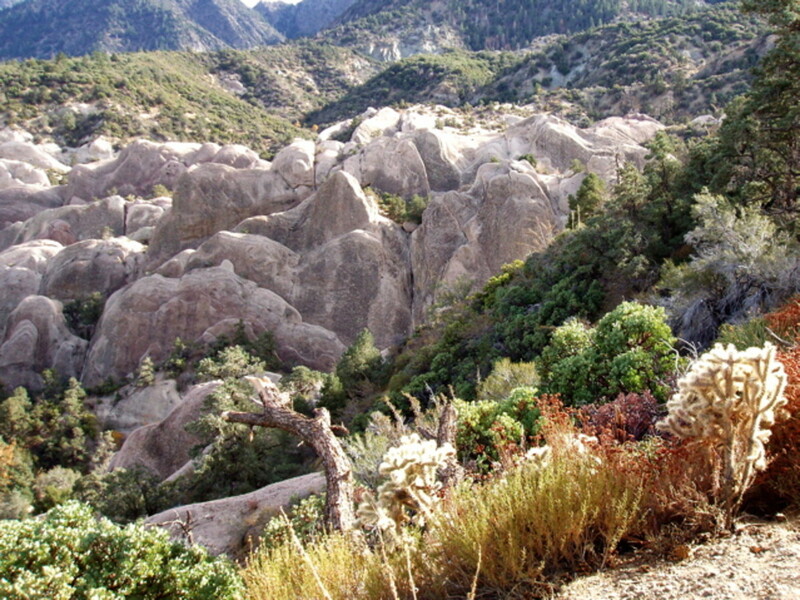 The Devil’s Punchbowl is a unique 1,310 acre geological wonder where visitors can walk, hike or take a horseback ride on a 7.5 mile round-trip trail through a deep canyon formed by the runoff of large quantities of water from the higher San Gabriel Mountains. ––LA County Parks Dept. Punchbowl Canyon is 300 feet deep, as measured from the vista point near the Punchbowl entrance. 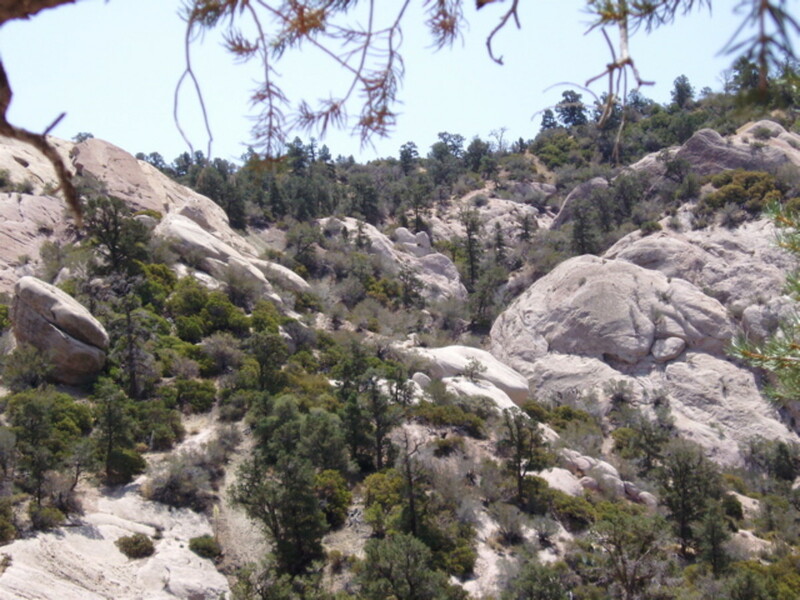 It lies in the middle of two major fault lines––on the west, the Punchbowl Fault running north/southwest; on the east, the San Andreas Fault running north/southwest. 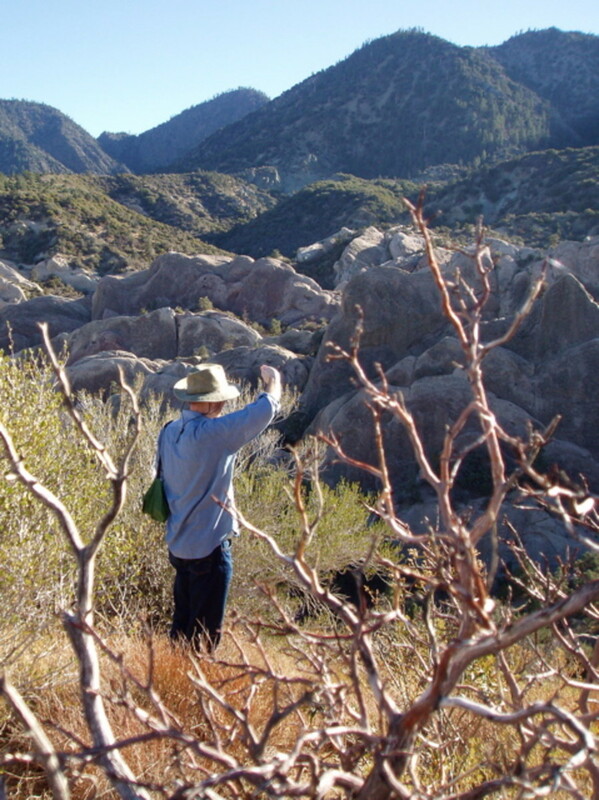 Sections of the San Andreas Fault are still active earthquake zones. 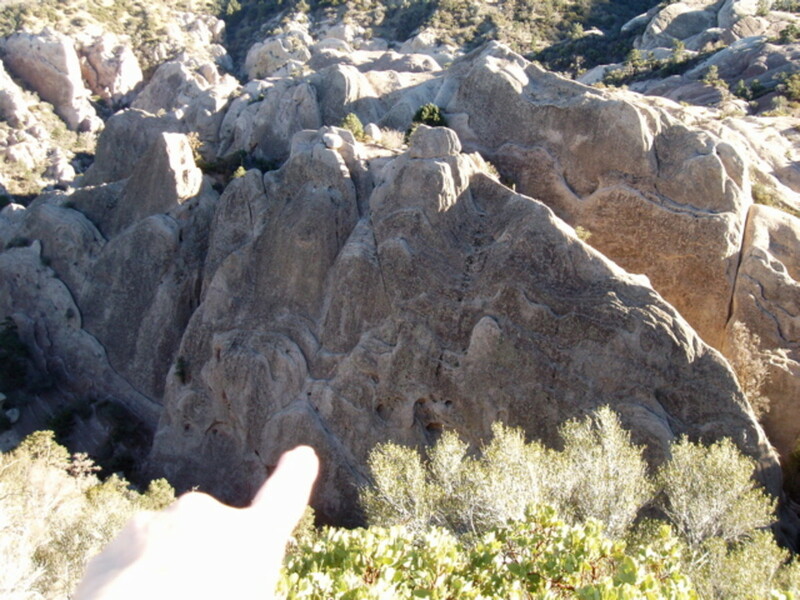 Inside the canyon there are several minor fault lines as well––the Pinyon Fault, Fenner Fault, and the Cocktail Fault, among others. You can tell where each of these faults are located by looking at the colors and shapes of the various sedimentary layers throughout the canyon. 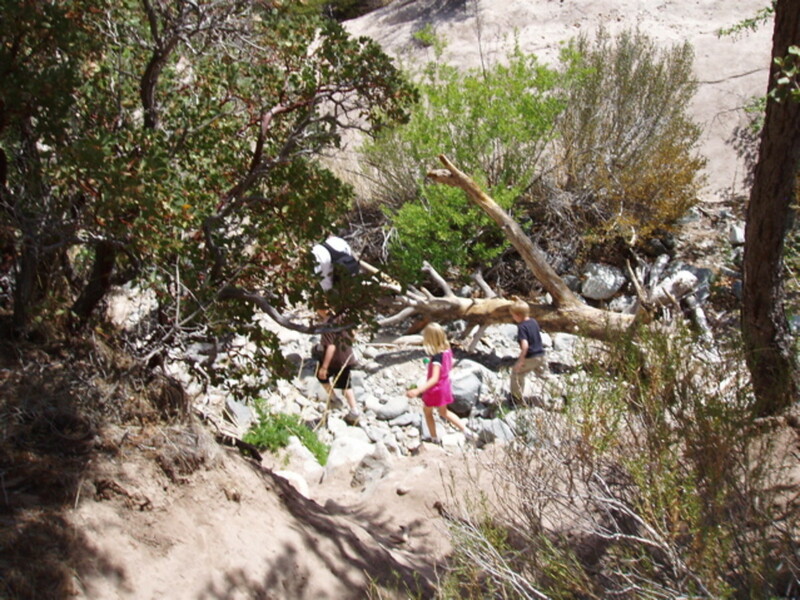 At the bottom of the canyon runs Punchbowl Creek, the ultimate destination of most family hikers. This part time creek is the only water left from thousands of years of water erosion, where falling rain dug vertical gouges and ravines out of the mountains as it flowed down their sides. 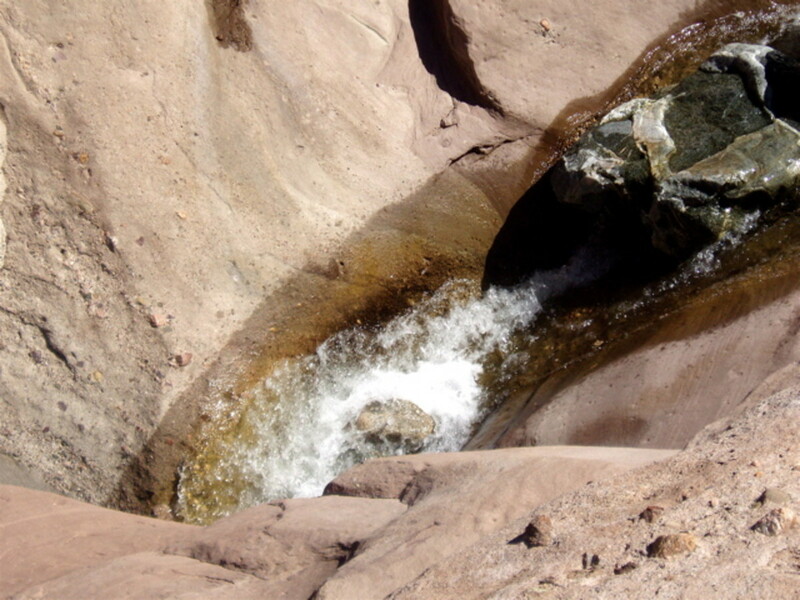 Punchbowl Creek starts from a waterfall about a mile up that looks like it's coming out of a rocky pipe. 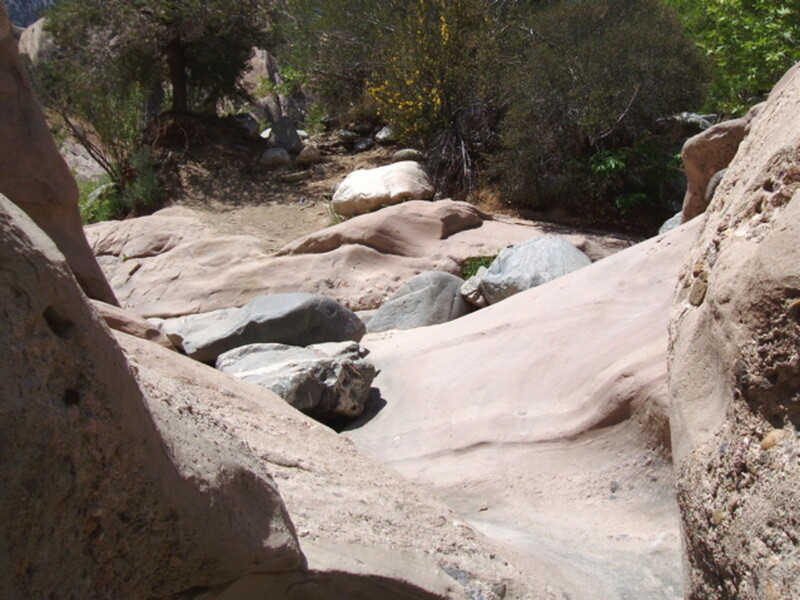 When the flow hits the stream bed five or six feet below, it trickles down the creek over rocks and sand for several miles beyond the canyon, then disappears into the desert. This video shows the process of water erosion. 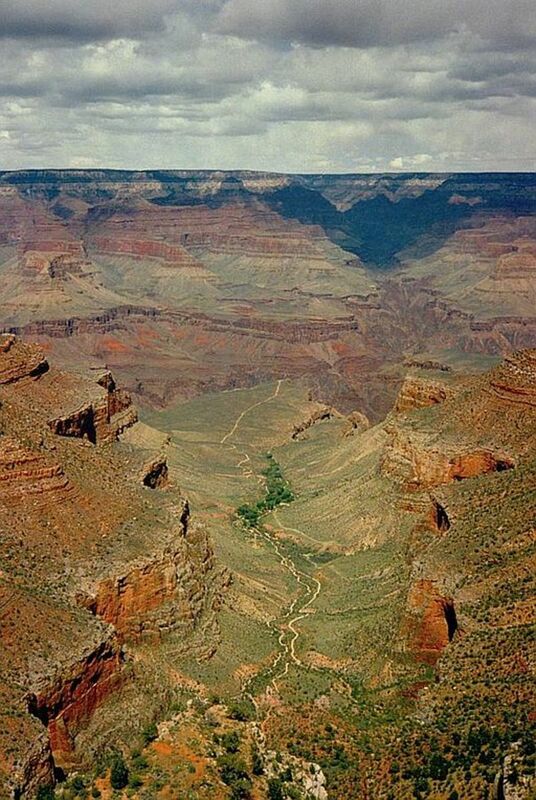 Imagine the mountains in the photo above being eroded in this way every time it rains or snows. The park is open from 9:00-5:00 every day except Monday, when it's closed. 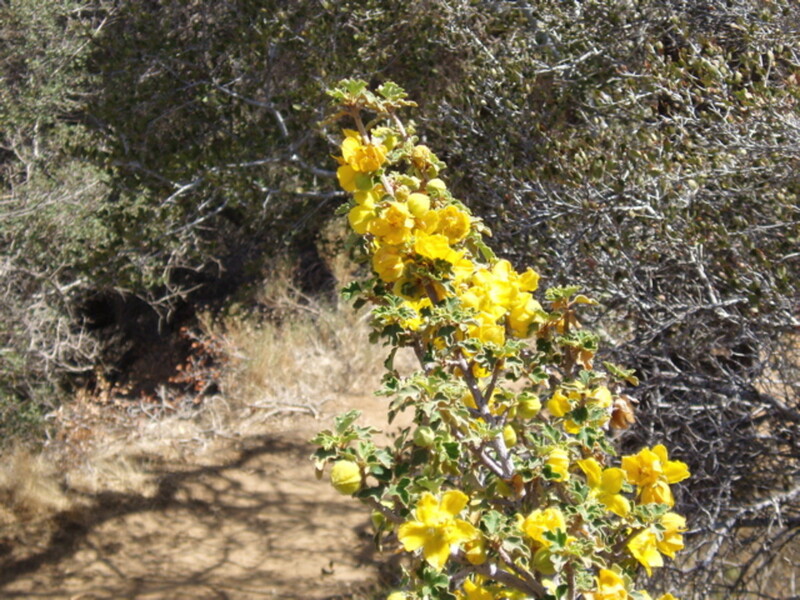 Trails start at the entrance to the park, where you'll find a small nature center and bird sanctuary. 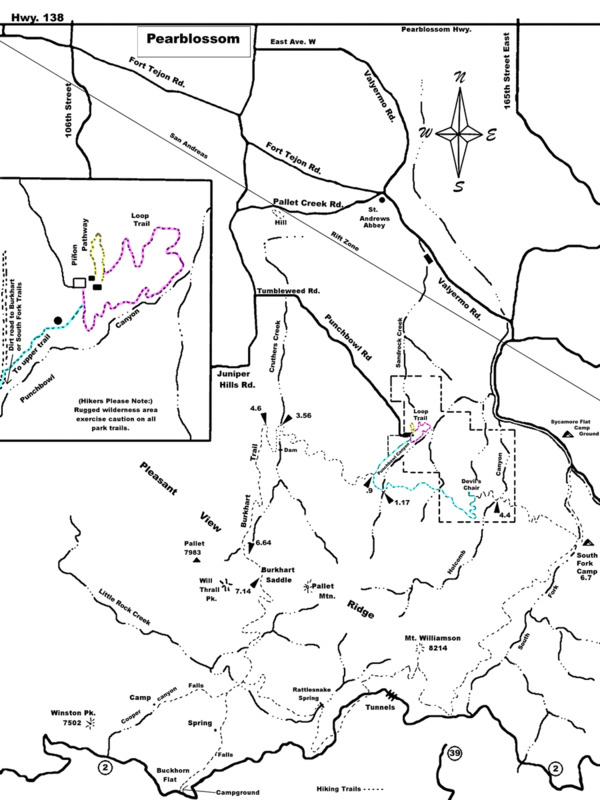 Here you can talk to a forest ranger or other attendant and pick up trail maps. 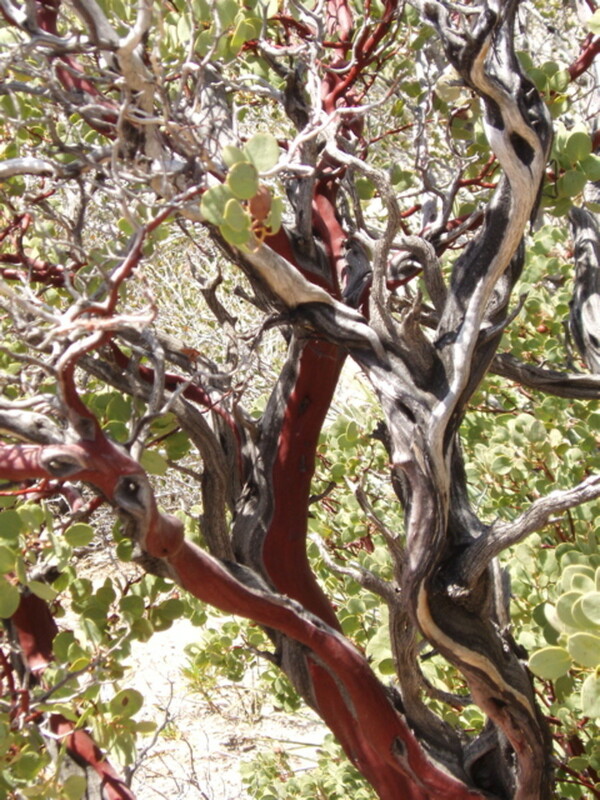 The forest ranger knows about animals and plants found in the area, and also about the canyon's geology. 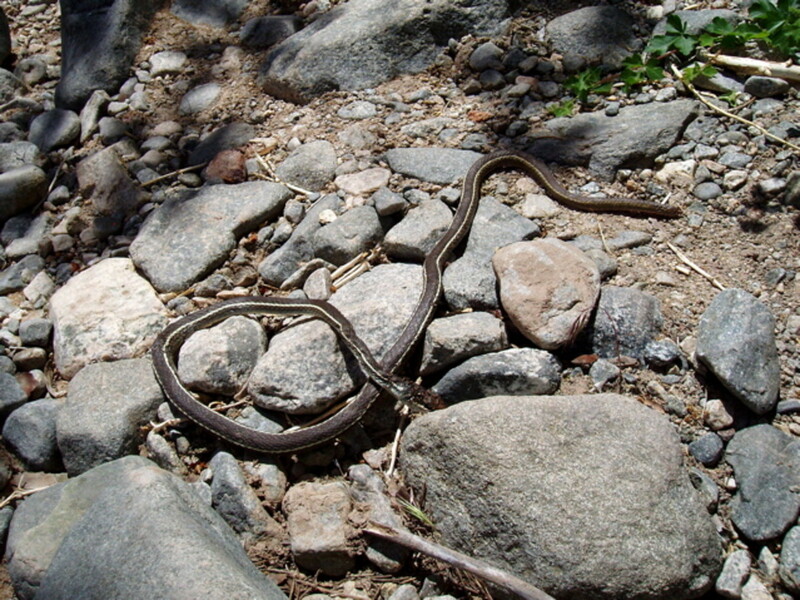 The nature center contains exhibits of live and dead snakes, lizards, birds, and other fauna. 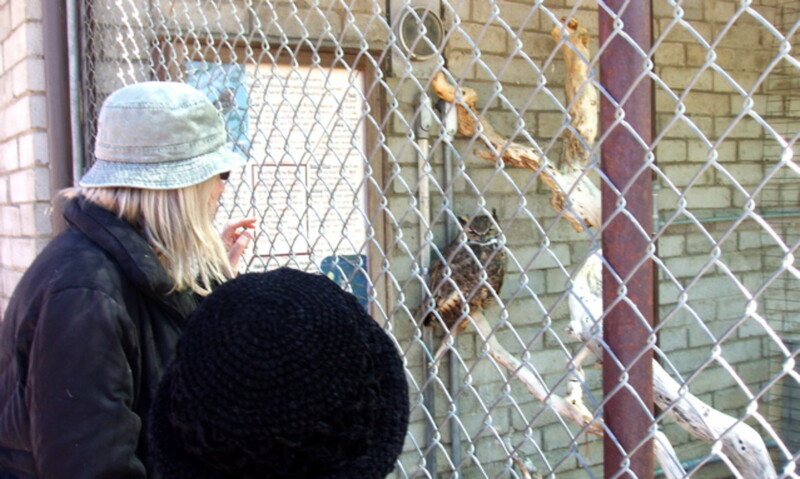 The bird sanctuary is a caged area where wounded birds are kept safe until they heal, or kept permanently if they are not able to fly anymore. 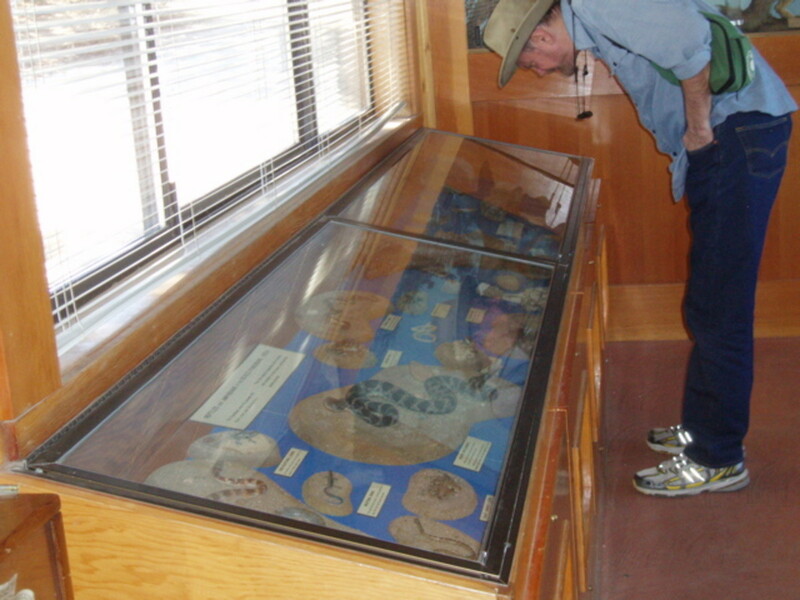 You can also pick up a schedule of events, if you're interested in guided tours or activities. 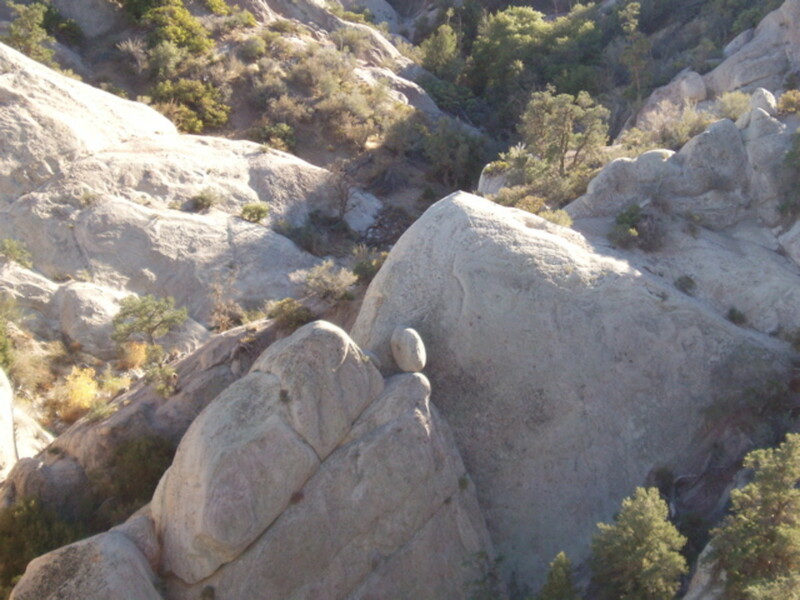 I've seen novice rock climbers practicing on some of the vertical rock faces, and school kids and scouts touring the area, with a guide explaining its history. 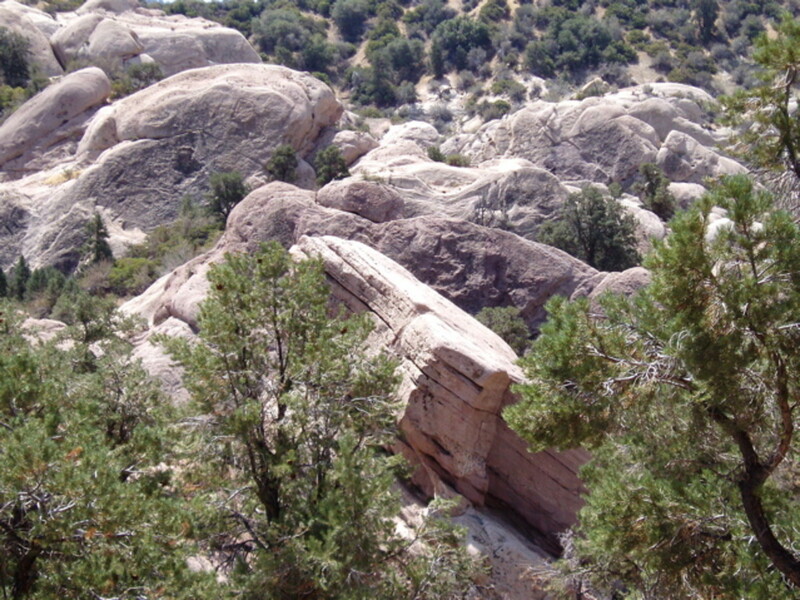 The park provides geology tours, nighttime stargazing tours, and full moon tours. 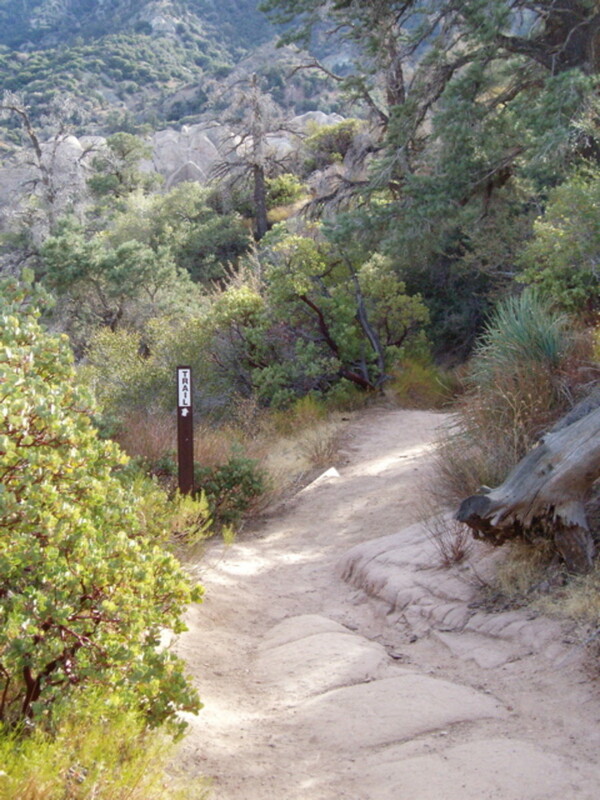 The Pinon trail is a short loop trail that stays on the upper level. 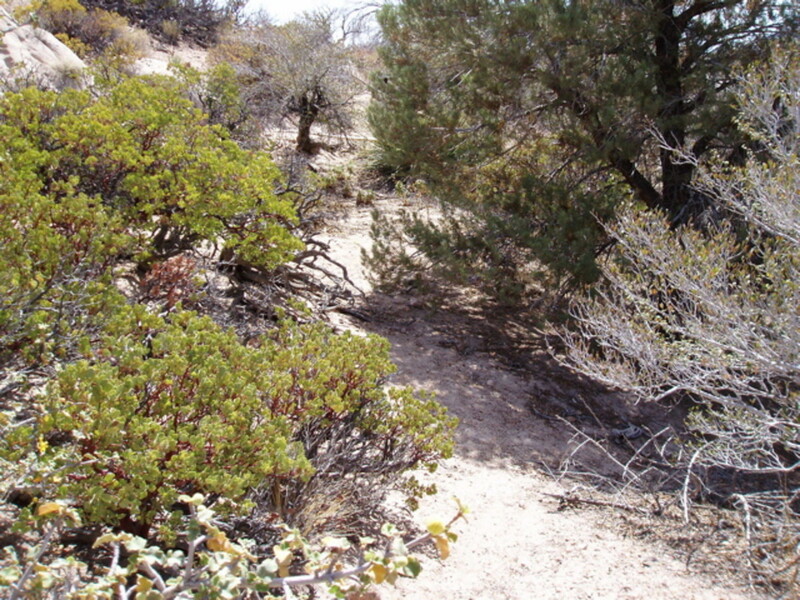 It's located to the left of the main trail, and is used to demonstrate some of the plants found there. 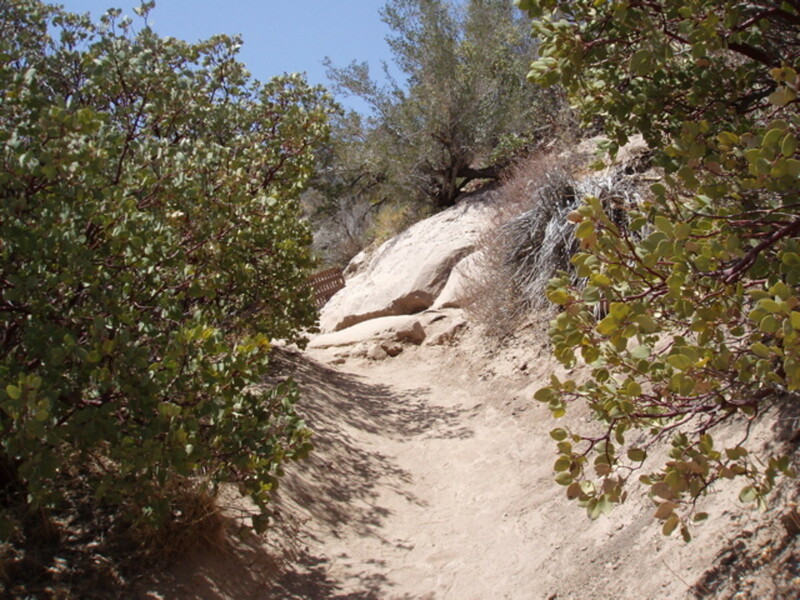 Non-strenuous hikers can take the main trail down a short grade, fork off to the right to trail the canyon halfway up, then circle back to the entrance. In the photo collection below, I call this the middle trail. 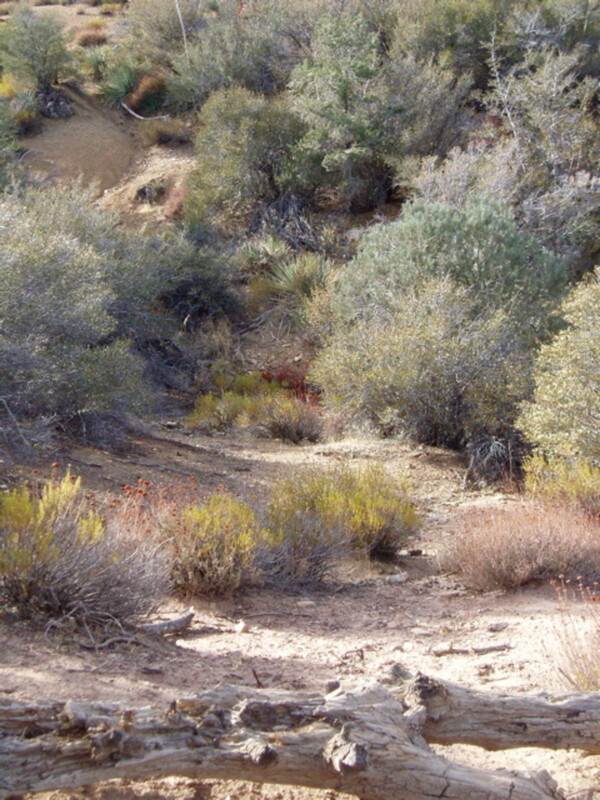 The steepest trail (main trail) goes all the way down the canyon to the creek bed 300 feet below. 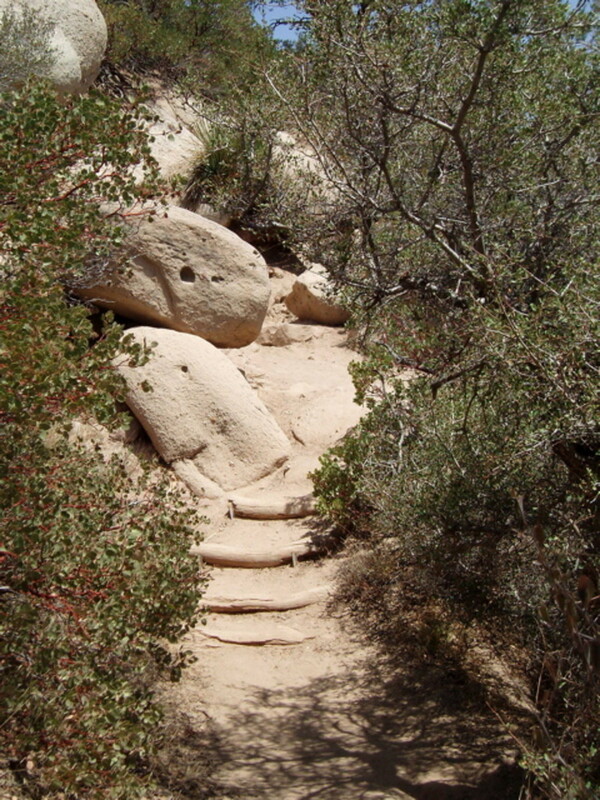 There it follows the creek to its head, past vertical rocks where students learn to rock climb, and curves back up with a steep climb to the top trail, which takes you back to the entrance. 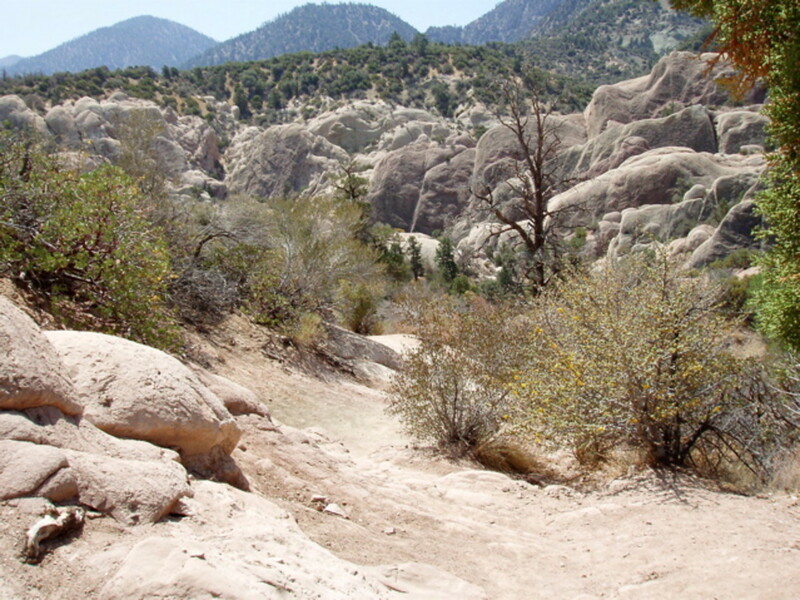 The longest trail is 4.5 miles and goes in a different direction. 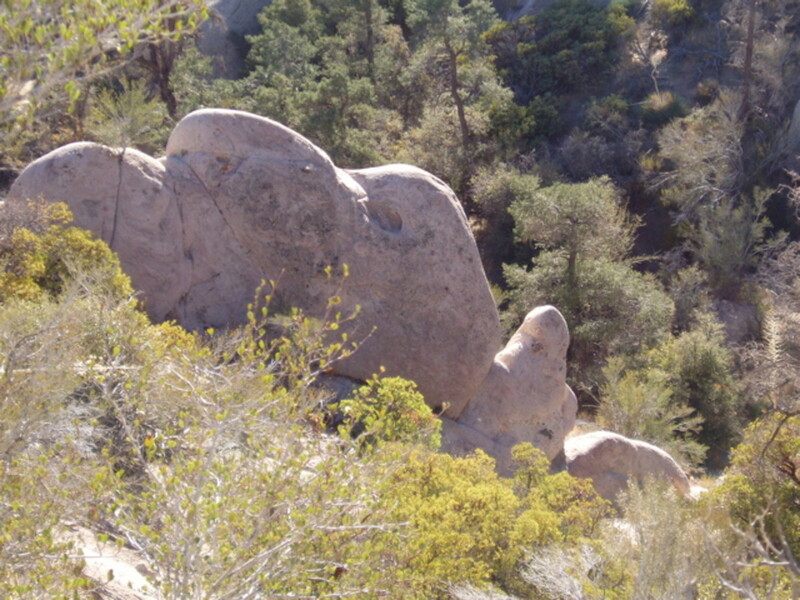 It heads across the top of the canyon a ways before dipping down into it and then up again, ending at a natural rock formation called Devil's Chair, from which you can see the entire Punchbowl. The one I like to follow is unmapped, which probably means it's not really a trail. It goes up the hill on the other side of the creek bed, and down again to a smaller creek where hardly anybody goes. 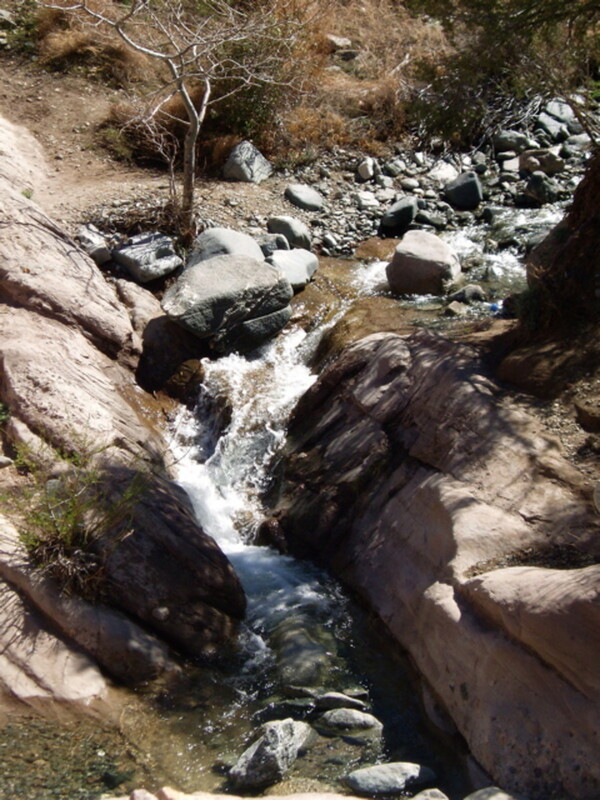 You can follow the creek around to the left as it winds around a hill, until joining the main creek below the canyon. Or you can climb up rocks to the top of the hills overlooking the main creek bed and make your way back to the entrance from there. Check out the photographs following the map below. 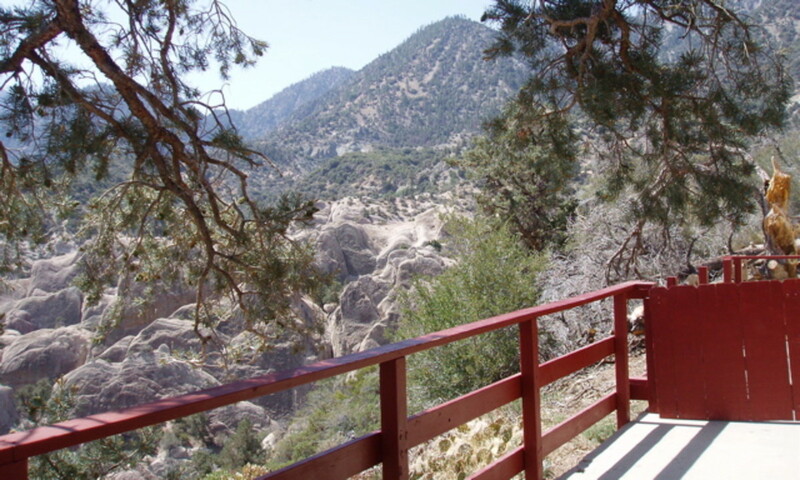 They will show you several views of the main trail, the creek bed, and a couple of minor trails. 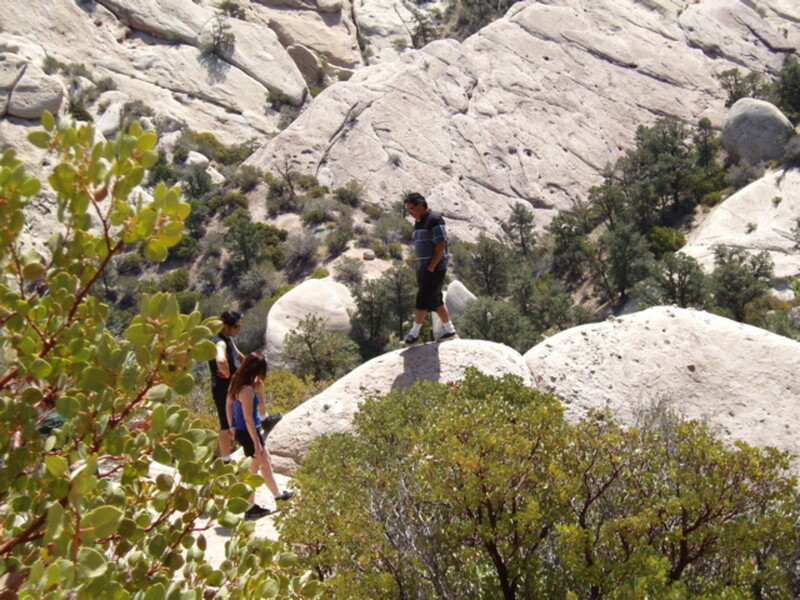 All kinds of people hike at the Devil's Punchbowl––individuals, families, scouting troops, college geology classes, astronomy enthusiasts, and rock climbers. Many hikers bring dogs. I go to photograph. 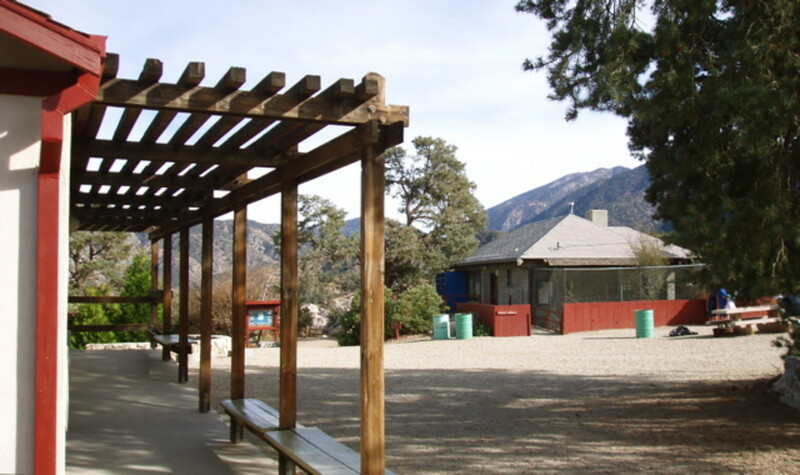 No food is allowed inside, nor is smoking, since the area is filled with chaparral, (which is highly flammable) but there are picnic tables at the entrance. Go on a weekday, if you can. The trails get crowded during the weekends. 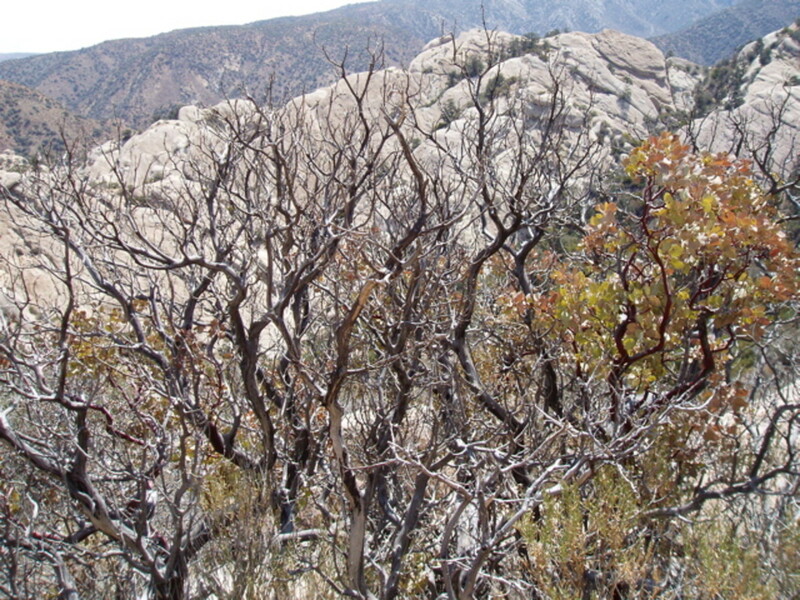 Also, the best time of year to hike is late winter through early summer. After that the creek dries out. Keep loud talking and yelling to a minimum. Instead, enjoy the peaceful atmosphere, sounds of birds, and the beauty of being outside in a majestic place. 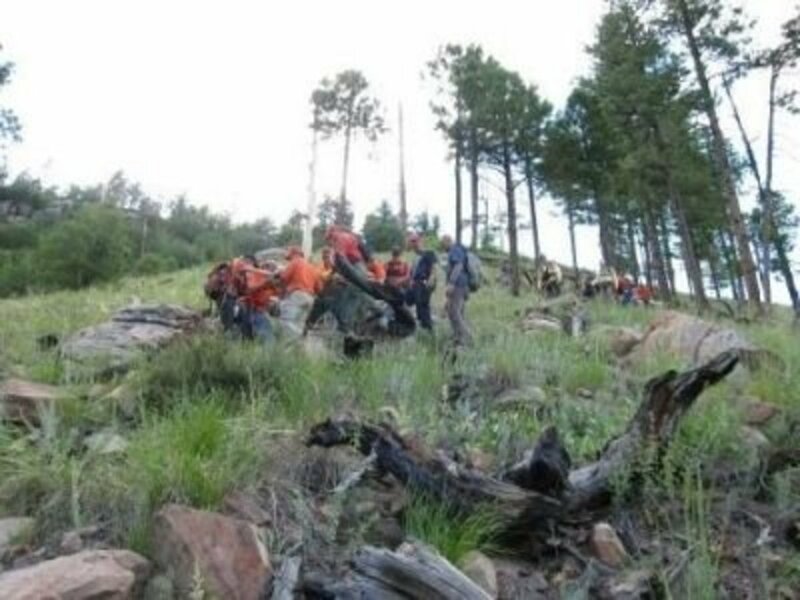 Pass single file when encountering other hikers. Greet them and keep your dogs and kids under control. Bring a fanny pack or other bag to keep trash in. 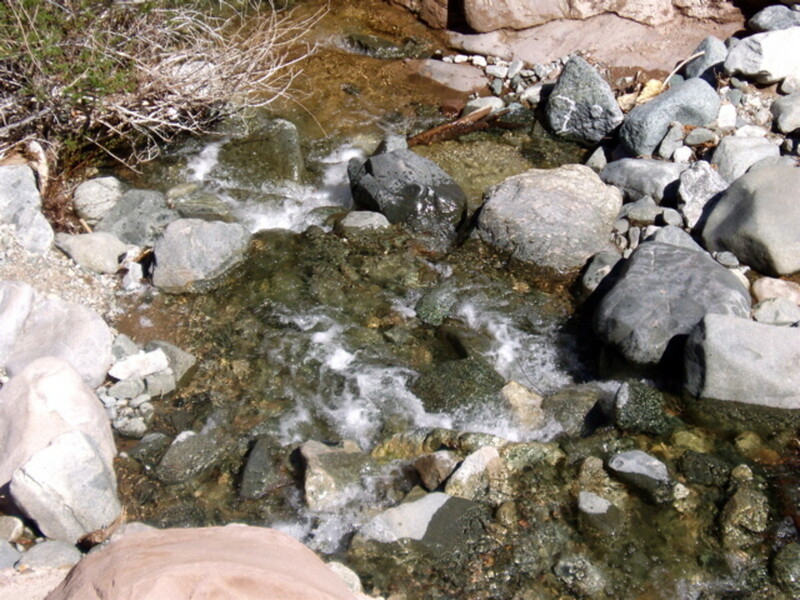 Dumping it by the side of the trail or in the creek bed is plain discourteous. My fanny pack has three pockets in which I carry my wallet (with ID), a compass, lip balm, a pen/paper, an energy bar, and trash. It also has a water bottle, which I love to fill with fresh creek water. Bring your camera in a padded case with a strap that will let you hang it from one shoulder and across your chest. I never go hiking without mine. I also bought an extra battery, which I use all the time, and a larger picture card. Take care of sanitary needs before you go down. 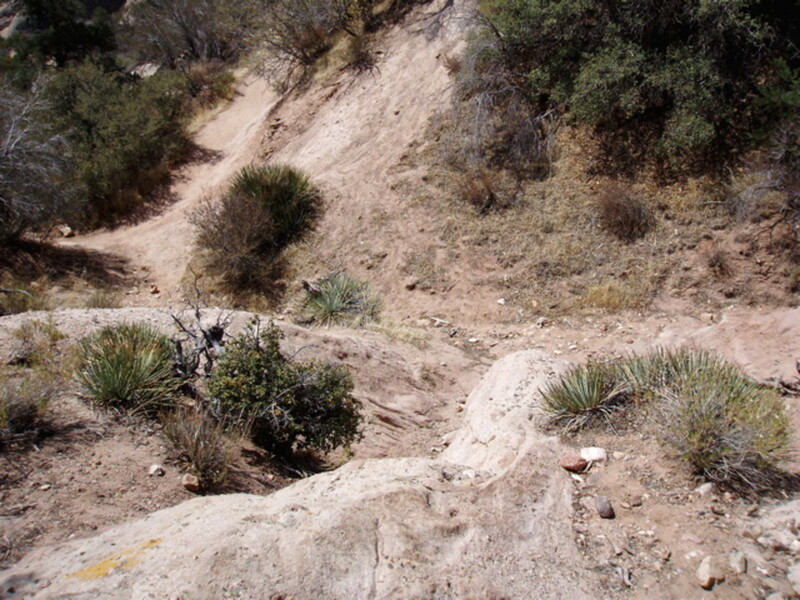 There are no facilities on the trails. Look near the entrance, behind the Nature Center, for the small buildings housing pit toilets. 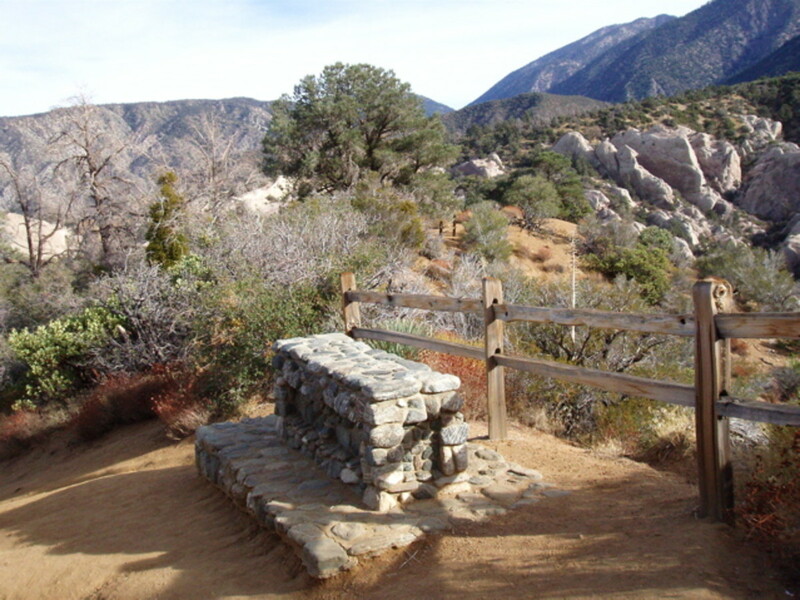 Devil's Punchbowl is a designated nature park run by the Los Angeles County Parks & Recreation Department. 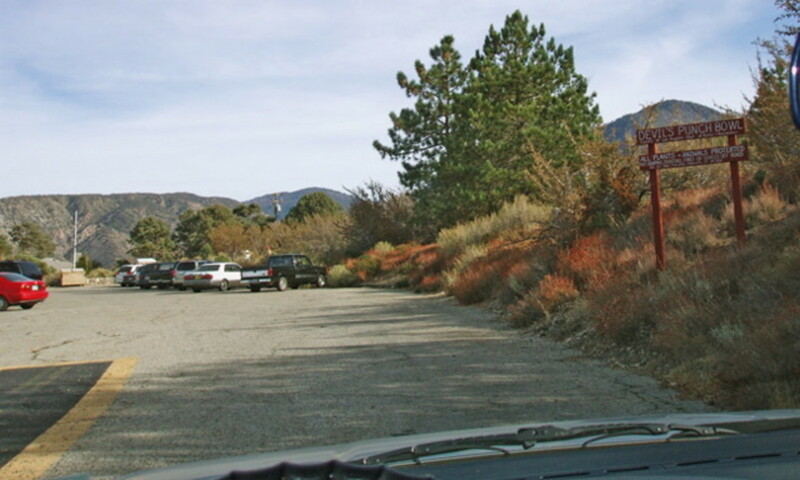 It is located in the mountains that frame the Antelope Valley, near Littlerock and Pearblossom, on the opposite side of the San Gabriel Mountains from Pasadena and Azusa. It takes about an hour and a half to drive there from downtown Los Angeles. I'm always hungry after a day of hiking. 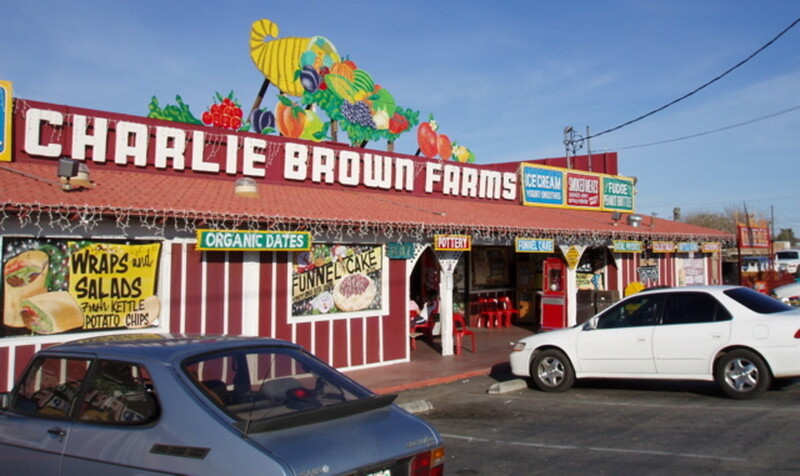 If you are too, be sure to stop by Charlie Brown Farms in Littlerock on your way out. They have a great market with local fruits and vegetables, lots of tourist items, and a little sit-down restaurant that offers buffalo burgers and great shakes (among other things). 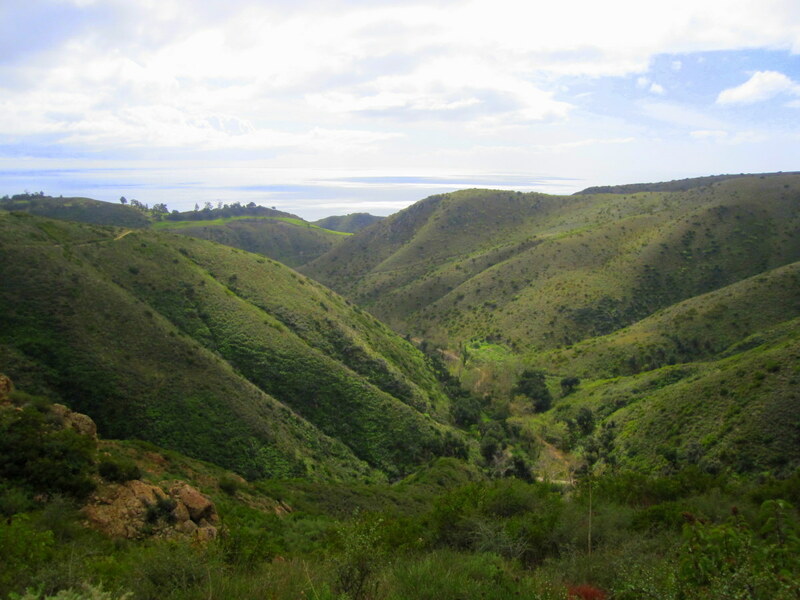 Check the map above for the Punchbowl's location and enjoy your hike! Thanks for all the detail. 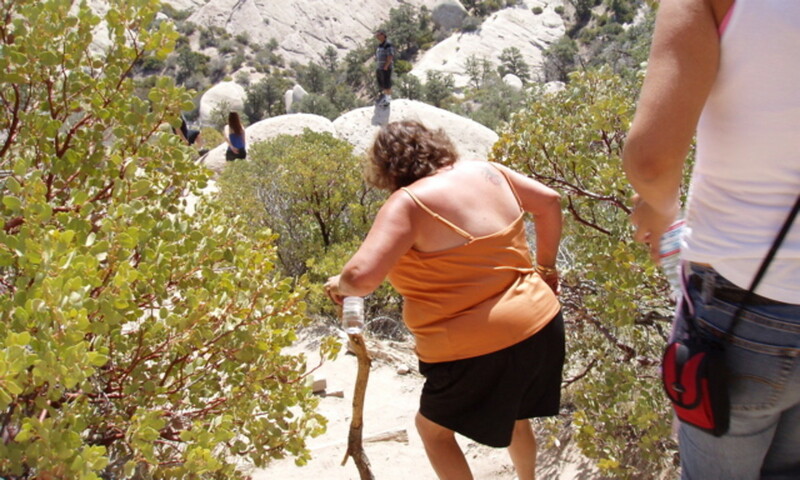 My wife and I love to hike...will have to check this one out! We are doing the Jingle Bell run in Pacific Grove this weekend, so my hiking will be along the ocean. Lovely hub. I am going to link to my hub on Pinnacles. Love the bit on hiking etiquette. Up Interesting, beautiful and useful is my vote for your hub. Well-done! 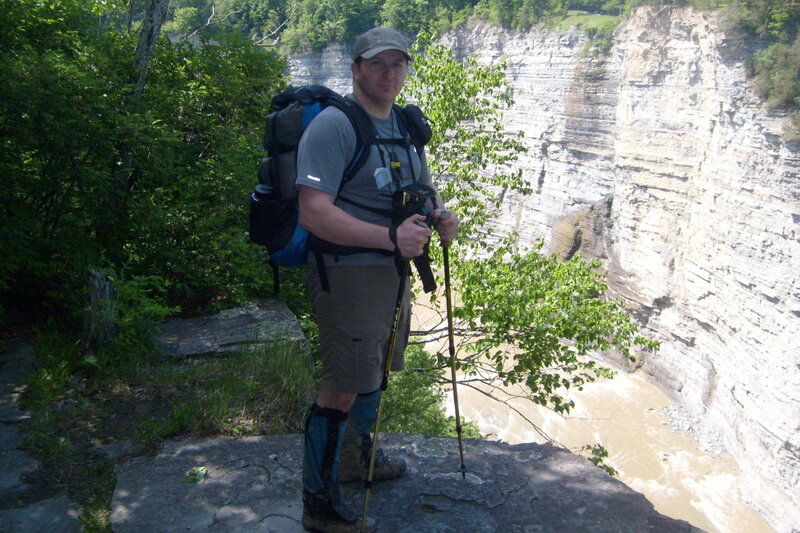 Your wonderful review and photos really made my feet itch for my hiking shoes. Rated up and awesome! What a lovely place to hike, i enjoyed your hub with beautiful pics, awesome hub. 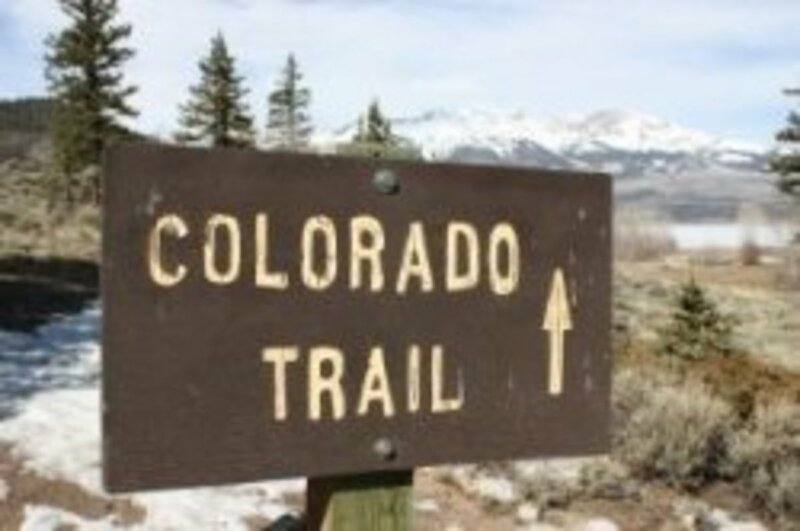 Very informative and interesting--one of these days I may just take one of those trails. 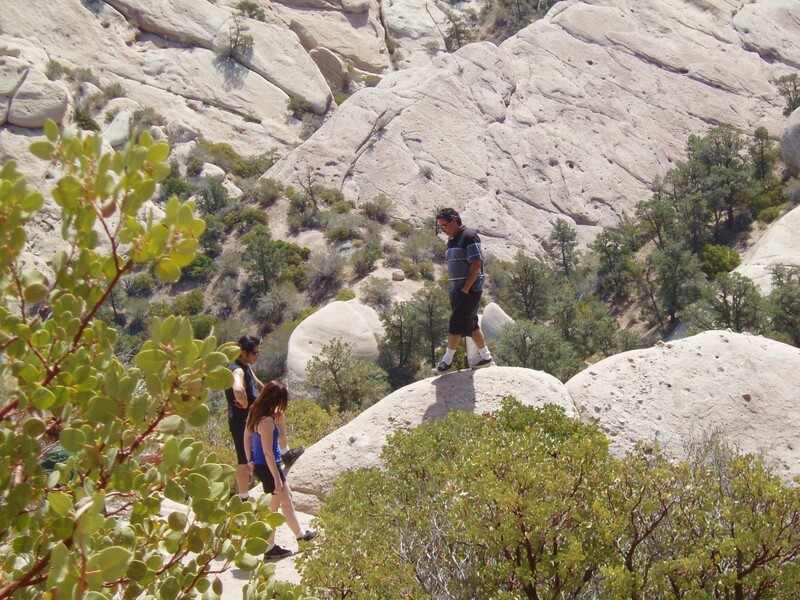 Great information about hiking trails. And I am looking forward to a buffalo burger...never had one. Wonderful photos. Thanks all. The Punchbowl is one of those places where you can take photos any time of the day and/or year and they'll all be different. Great review! I've never even heard of it. Looks like a great hike and the pictures are great! Thank you for the tour, tips and wonderful pictures. Looks like a great place to hike! I like finding those areas that feel remote even though they aren't too far from the city. 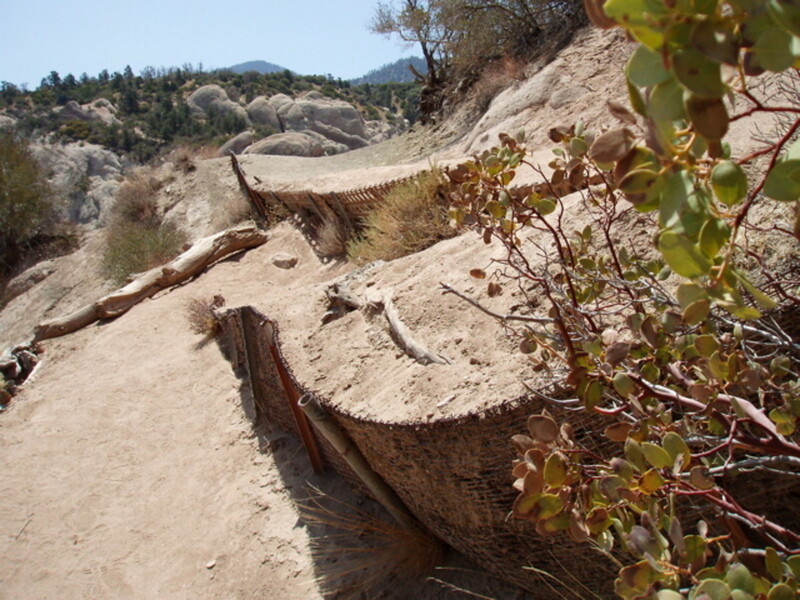 Once when I was hiking here I pretended I was a Native American hiding from another tribe. (I know, I'm an adult, but it's still fun to play when no one knows you're doing it.) I found some really cool caves that aren't readily noticeable, and could easily see how a tribe could survive in the canyon. Thanks for reading and commenting. What a gorgeous place to hike! 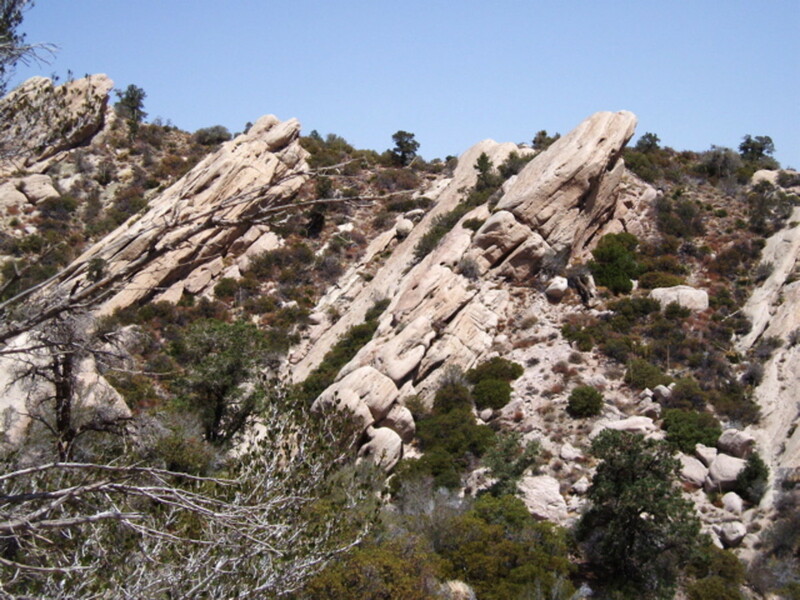 I used to hike along the coast in Ventura County, but never made it inland to hike in the San Gabriel Mountains. Hi watergeek - Good writeup here and very enjoyable photos. Thanks.